This year has been a turning point for us. A new love has come into our lives. It has taken us by surprise, creating unexpected emotions. Maybe new isn’t quite the word. It had been hovering around – all grated for things like breads and muffins. But now we have a pure, unadulterated love for it. Oh, zucchini. I’m sorry I haven’t appreciated your awesomeness all these years. But I promise we will make it up to you. You will no longer be relegated solely to zucchini chocolate chip muffins. You can stand in the spotlight. Bring a large pot of water to boil. Cook the soba noodles for three minutes. Drain the water. Place the noodles back into the pot. Add the zucchini ribbons. Using tongs, mix the butter and sesame oil with cooked noodles and zucchini ribbons. In a small bowl, stir together tahini, orange juice, vinegar, ponzu, honey, ginger, jalapeno, and mint. Add to the noodles and zucchini. Turn heat on low and toss the sauce with the noodle mixture. Once the sauce coats the noodles and zucchini, take off heat. Sprinkle with sesame seeds and serve. I'm in need of a summer dish! Where was this before I sat down for lunch? YUM! I LOVE zucchini. To death. My dream is to have a zucchini garden with fresh zucchini whenever I want it. What a wonderful noodle dish! I wish I could get hubby on board with zucchini...he clumps them together with cucumbers as untouchables :/ I'll make this just for me! I love soba noodles. I have made zucchini noodles with regular pasta but this looks great! I miss all my zucchini plants... I have start planting some seedlings soon at the end of our down-under winter. This noodle dish is beautiful... with zucchini being the star of this dish. I discovered courgettes (aren't horrible) last year after growing my own and am always looking for new things to do with them. This looks great. Marvelous summertime lunch idea. The zucchini ribbons seem to mix in with the soba quite readily. Light and delicious! You picked the perfect time of year to fall in love with zucchini - you can find it in abundance this time of year. I'm hoping if Seattle ever sees any sun, my zucchini plant will do well. I love the ribbons you've made. I'll give this a try. It sounds delicious. Delicious dish! I love zucchini and I am always looking for new recipes....That sounds amazing! This is a perfect dish and then some added jalapeno for a bit of a kick. Loving this. This looks awesome--I have a shaved zucchini salad recipe that I like, but this totally one-ups it. Oh my goodness, this looks great! I never made such gorgeous dishes when I was a vegetarian, but I wish was as creative as this! The same thing happened to me a few summers ago and now I love it! Especially when mixed with such a flavor bowl of noodles! Perfection. I love soba noodles. The zucchini ribbons is such a great idea and they look so pretty! These noodles look amazing! Wish I could eat them now. Girl, these noodles look delicious. I love using soba noodles. Also, I just wanted to stop by to tell you that you won the Land O Lakes butter giveaway. Woot! Stop by my site for details. Haha! Zucchini must be happy hearing that. :-) I love how light this dish is. 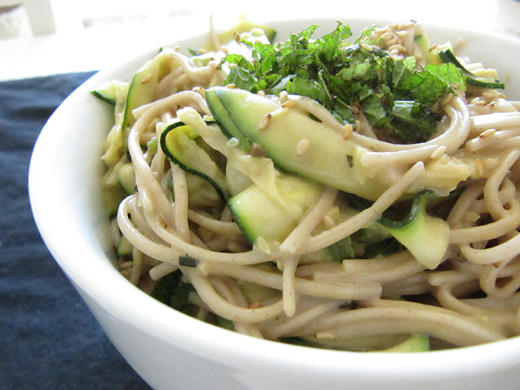 I actually love zucchini but never combined it with soba. Sounds great for the summer time! This dish is a great spotlight for zucchini! Love these flavors and soba noodles and the jalapeno. I love zucchini and have a couple of plants in the garden. I can't wait until it is ready to pick. This dish sounds wonderful! Looks delicious! I should cook with zucchini more often! That looks like such a fantastic and refreshing summer meal that I wouldn't mind having in the middle of winter as well. :P It seems so delicious it's making me drool! I have cultivated zucchini plants in my garden and now I pick 2 to 3 zucchinis per day! I love them and this dish is marked! I'm so glad you discovered zucchini in all its glory! It sounds so delicious in these noodles! Yum!! I love the idea of ribbons with noodles, and the sauce sounds tangy, spicy... and ok I just love it all :) Happy 4th! Looks delicious! A nice light meal for these 100 degree days! I love soba noodles so I'll definitely be giving this a try! Last night I made a quick salad with fresh zucchini ribbons, tomatoes, red onion, minced basil, and balsamic vinaigrette. Zucchini is so versatile! How fresh and gorgeous! And hehe I was wondering what the new love was- love zucchini too! This looks very light and fresh. Beautifully done! This noodle dish does look delicious! Such a healthy, filling and tasty soba dish! This sounds refreshing and delicious, especially with the slight kick of the jalapeno. And *gasp* you haven't been a big fan of zucchini before? It's like one of my favorite veggies :) Funnily enough, it was just last week that my husband turned to me and said..."You know, I really like zucchini." Maybe it's something in the air? A couple of things: 1) zucchini chocolate chip muffins? Please share! and 2) I love this recipe. The combo of jalapenos, mint and avocado with zucchini? Fantastic. I love all the fresh flavors in this! Perfect for this hot weather we're having! And lovely way to use summer zucchini! That flavor combo sounds incredible! I'm so boring with zucchini and noodles... think red sauce and some diced veggies... must try this! The chopped herbs on top look so pretty too :) YUm! What a great way to use zucchini! تتمتع بأفضل المعايير التي يتم الاعتماد عليها في جميع أنحاء العالم ؛ قامت شركتنا باعتبارها أفضل شركة عزل اسطح بالدمام بتدريب مجموعة من العاملين على مستوى من التميز والخبرة في أعمال العزل المختلفة . copyright Jennifer Kendall 2011. Powered by Blogger.